The Lower House witnessed noisy scenes as members of the Congress and some other Opposition parties were in the Well raising slogans against the government and protesting lynching incidents. NEW DELHI: Lok Sabha witnessed unruly scenes on Monday with a few Congress MPs tearing papers in the House in protest as their adjournment motion was rejected. Terming the conduct of MPs as ‘unbecoming’, Lok Sabha Speaker Sumitra Mahajan suspended six MPs from the proceedings of Parliament for five consecutive days. The Lower House witnessed noisy scenes as members of the Congress and some other Opposition parties were in the Well raising slogans against the government and protesting lynching incidents in the name of cow protection almost since the House assembled in the morning. The House was adjourned till 2 pm after some time as the Congress members remained in the Well and the ruckus continued during the Zero Hour in the afternoon. “The entire country should watch this. Show it, let them watch,” visibly angry Mahajan said as torn papers were scattered on the floor. The Speaker announced the suspension soon after the Lok Sabha reconvened at 2 pm, which prompted the Opposition to launch another protest and force the House to be adjourned, first till 2.30 and then for the day. “Gaurav Gogoi snatched papers from the table and waived them towards the Chair. K Suresh snatched papers from the table, tore them up and threw them towards the Chair. 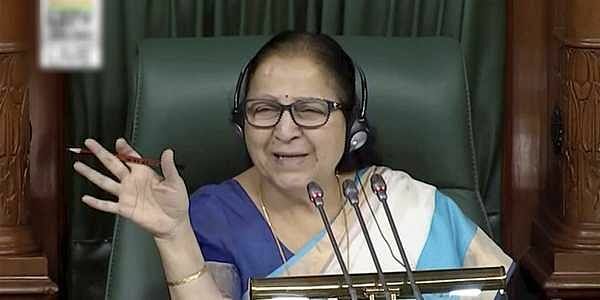 Adhir Ranjan Chowdhury, Ranjeet Ranjan, Sushmita Dev and M K Raghavan tore papers and threw them towards the Chair,” the Speaker said in her order.